Not many people can list gourmet ice cream bar consultant on their resume, but that’s just one of the interesting job titles food scientist Jennifer Martin has had over the course of her career. After graduating with her BSc in Food Science in 1979, Martin earned an MBA through the UBC Sauder School of Business. She worked in food product development for a number of major companies - Loblaws, Heinz, and Dickie Dee Ice Cream – before striking out on her own and starting a company that placed water vending machines in grocery stores. That experience, along with an interest in herbs, eventually led her to create SIPsoda, a Vancouver-based company that produces “Simple Infused, Pairings of Botanicals and Fruit” set in a sparkling spring water base. Martin worked out of her kitchen, pairing fresh herbs and citrus peel, trying to come up with a unique beverage with strong health properties that used very little sugar. The result was compelling flavours like lavender lemon peel, coriander orange and rosemary lime, each with 80% less sugar than regular soda and only 25 calories a serving. 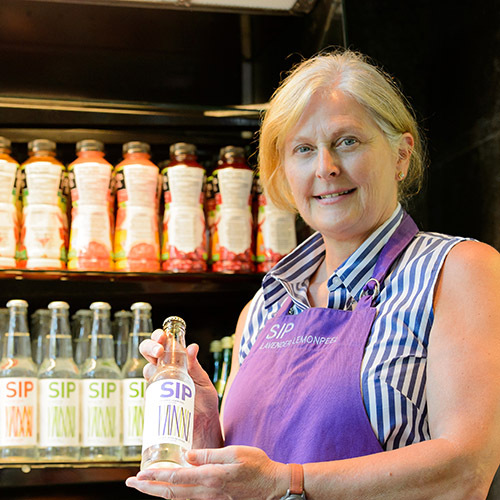 SIPsoda is sold at Whole Foods, Urban Fare, Loblaws City Market and select Save on Foods, as well as served in restaurants around Vancouver, including UBC’s Point Grill.